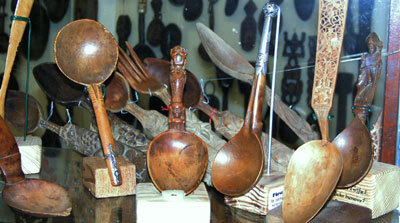 Wooden spoons are said to have survived also from the Neolithic period of Chatal Hüyük; unfortunately, Gerd Kampffmeyer was not able to find them in any museum of the world. Spoon fragments found in lake dwellings near Swiss or Austrian lakes are dated from 2800 to 2500 before Christ. The early spoon had a short handle with a round, bulbous front part; people ate of earthenware bowls; when the plate - a novelty of the Netherlands - was invented in the 14th century, the front part became oval. The simple human being carved his spoon on his own, the urbanite was dependent on the work of the spoon carver – a reputable guild. In 1710, two workers in the Erz Mountains invented the metal spoon which set out to conquer the wooden spoon. Our small gallery shows you a selection of different cultures.